We love a winter wedding and whether you are a wedding guest or a Mother of the Bride or Groom, no outfit is complete without a beautiful winter wedding hat to complement your outfit. Our Autumn/Winter 2018 range features gorgeous winter wedding hats adorned with feathers, flowers, bows, jewels and veils; each designed to set-off a gorgeous winter coat and outfit combination. 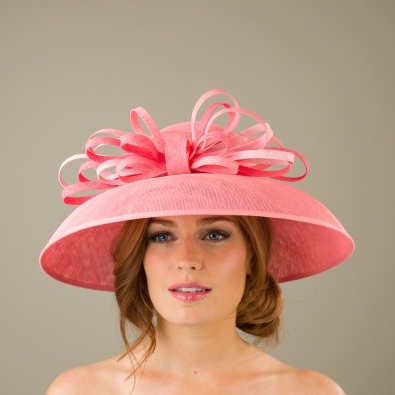 We adore the Cooper Pillbox hat and it is a great winter wedding hat. The Cooper features a luxurious felt base, featured here in Alabasta felt which is a new shade for 2018. It is then trimmed with a large English-style rose which is beautifully framed with a crinoline bow and two short feathers. New for Autumn/Winter 2018 are our cocktail hats. 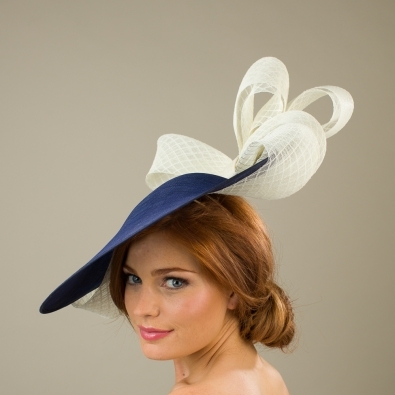 Our cocktail hats are small and beautifully formed and are designed to be flat to the head and perched to one side. One of our favourites is the Blyton which comprises a felt disc base is adorned with a jewelled spider, bee and flower in metallics and diamanté. This will look gorgeous against a winter coat and will add that special finishing touch to your outfit. If you are looking for something a little larger then the Austen Dish hat is an absolutely beautiful choice, and we think that this hat is perfect for any winter mother of the bride. 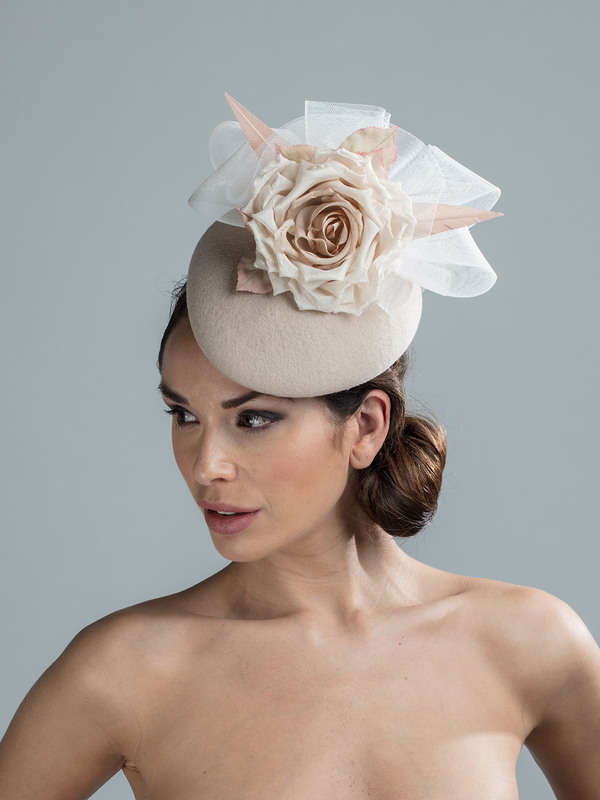 The Austen dish hat comprises a felt dish base available in a large choice of colours and is trimmed with a large, double-looped, diamond patterned sinamay bow. The loose ends of the bow wrap neatly around the brim edge. You can choose to have the bow in a colour to match the base or a contrasting colour; either of which will look fabulous. The hat is made on a hair band which we will match to your hair colour. Another of our favourite winter wedding hats is the Atwood hat. 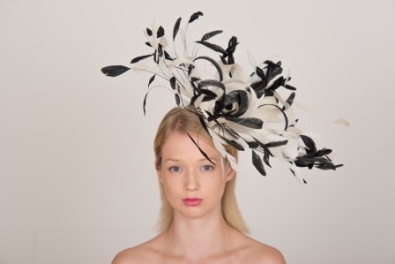 Perfect for a winter wedding or a day at the races, the Atwood dish hat comprises a small tear-drop shaped felt dish base with upturned edges beautifully adorned with orchid style flowers. The hat pictured here is made on a hair band which will be matched to your hair colour. We want you to be able to choose a hat which perfectly matches your outfit so you can have your Hostie Hat in any combination of available colours. Take a look at our felt colour chart to see how we can adapt the hat to match your outfit. You can choose the colours yourself or we will work with you, free of charge, to ensure you are perfectly colour matched for the big day. We send out colour samples, free of charge, all you need to do is contact us via info@hostiehats.co.uk. Happy shopping and I look forward to creating your dream hat soon.